The אור גנוז, the hidden light, is the ancient and primordial light that illuminated the world for the first 36 hours of creation. Then God concealed the light. Some of this light is for the righteous in the world to come. Some of it is hidden in the secrets of the Torah. Those who study Torah, toil in it, live by it, yearn to be close to Hashem, and who are constantly trying to improve themselves moving in the direction of Hashem's holiness, they also get a glimpse of this hidden light. Hidden light is clearly a pair of semantically related key words. 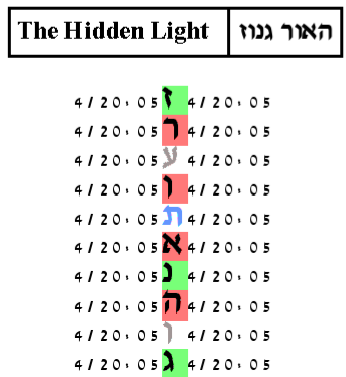 Therefore, it is natural to explore all four key word pairs of אור and האור with גנוז and הגנוז. Using our standard protocol, the probability that a text from the ELS random placement text population would have as combined compact meetings that we observed in the Torah text is 1/10,000. The pair the is mainly responsible for this small p-value is האור and גנוז. The table is shown below. The expected number of ELSs was set to 10. The cylinder size is 1. The probability that a text from the ELS random placement text population would have as small an area table as this one is 1/10,000. The light of the Golden Menorah of the temple illuminated with some of this hidden light. This is also the light of the Chanukah menorah. Its 36 candles represent the 36 hours that the hidden light illuminated the world. That is one of the reasons why we are not allowed to make use of the light of the Chanukah candles, although we see it and indeed make efforts that all who pass our homes see it too. Thus it is natural to link the key word Hidden Light with The Menorah and The Secret. The expected number of ELSs was set to 10. The cylinder size is 3205. The probability that a text from the ELS random placement text population would have as small an area table as this one is 6.5/10,000.